What exactly is Soundwave doing? Let me start out by saying a HUGE thanks to our friends at The Hub for getting us an exclusive preview of the season premiere of Transformers Prime: Beast Hunters. This article will not contain spoilers, so feel free to read ahead! At the end of Season 2 we find our Autobot friends in a very tight spot, as Megatron destroys the Autobot base. That’s right where we pick up with Season 3. This episode is all about the Decepticons, and focuses on how far Megatron will go to locate the Autobots and extinguish the spark of Optimus Prime. Unfortunately for Megs, (kind of a spoiler?) Prime had dispatched the Autobot team via groundbridge just before the fatal blow to the Autobot base. BUT! Does that mean that all of our heroes escaped without harm? While there is a small look at Team Prime in this episode, and a good explanation of why Shadowstrike Bumblebee has plagued the toy aisle at your local big box stores, this episode really is about the Decepticons. This is a two part episode, so go ahead and be prepared for that. By the end of the episode Megatron realizes that it’s going to take a look of creativity to locate the scattered remains of Team Prime, so what does he do? He sends a team to Cybertron to look for some relics that could help locate, and exterminate, the Autobots once and for all. However, what Megatron finds on Cybertron proves to be much much much much (notice that?) more valuable that any relic, or current Decepticon, that he has on-hand. And Starscream; there is lots and lots of Starscream in this episode. Overall, this was one of my favorite episodes in the entire series; this episode has everything you love about Transformers. 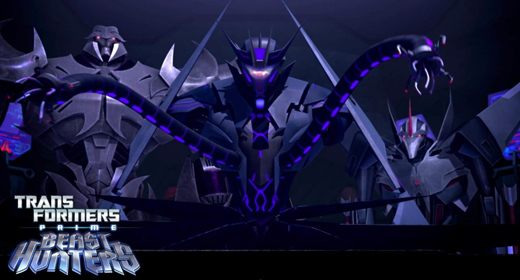 So make sure you are glued to your flatscreens tonight at 7:30 PM EST/6:30 PM CST for the Season Premiere of Transformers Prime: Beast Hunters! AND remember how I said this was a two-part episode? Make sure you check back next week for our EXCLUSIVE PREVIEW of Episode 2!